Daniel Cormier jokes about asking the UFC to fight Ilir Latifi or Corey Anderson and why they are now facing each other instead. Daniel Cormier is no stranger to being called out by his fellow fighters. 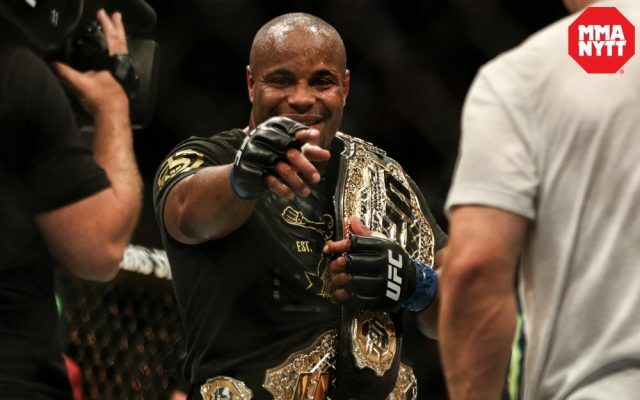 As the reigning heavyweight and light heavyweight champion, Cormier has heard his named being dropped a lot more frequently with fighters from two different divisions gunning for his belts. While some fighters such as Curtis Blaydes have basically said calling out Cormier is a waste of time considering he has a huge money fight on the table against former WWE superstar Brock Lesnar in early 2019 with plans to then retire by March, others have still been clamoring for a chance to face him. One of the loudest people to call Cormier’s name after his last win in July was light heavyweight contender Ilir Latifi, who went on the attack both via social media and through interviews while trying to goad the former two-time Olympian into a fight. Unfortunately for Latifi, the UFC had other plans and ultimately matched him up against former “Ultimate Fighter” winner Corey Anderson, who had also been asking for the chance to face Cormier. They now meet at UFC 232 in December. Upon hearing about that fight being made, Cormier offered up a response to both Latifi and Anderson while having some fun at their expense now that neither one of them are going to compete for his light heavyweight title. “The UFC got tired of giving me free money and I asked. Trust me, I asked to fight Latifi, I asked to fight all those guys,” Cormier said recently on “UFC Tonight”. “All work is what? Easy work! The easy work would be Latifi and Corey Anderson. Cormier also shot down the idea of competing as early as UFC 230 in November as the promotion is still searching for a main event to headline the card at Madison Square Garden in New York. While he’s still recovering from a broken hand suffered in his win over Stipe Miocic in July, Cormier knows it wouldn’t be healthy getting back down to 205 pounds in approximately seven weeks until that card takes place.